The “Chilly” Chili & BBQ contest is in its 26th year and sponsored by the Capital City Post No. 8787, Veterans of Foreign Wars in northern Austin. To get there, I rented a car at the airport and wrestled with the Friday afternoon traffic. Coming from traffic ridden California; the hardest challenge on the road was not taking the highway 183 exit to Lockhart. I saw the sign on the freeway and my heart dropped at the missed opportunity. If I had an extra 3 hours, I would have driven in the exact opposite direction for a slice of beef clod from Smitty’s Market. To have flown all that distance without a taste or look was disappointing. But I drove on. The contest was sanctioned by the International Barbecue Cookers Association (IBCA), one of four organizations that sanctions BBQ contests in the state of Texas. There aren’t many IBCA contests in California but I did cook in one three years ago in Oakland. Upon my arrival, I parked my car in the VFW parking area and wandered around the dirt lot beyond the pavement. It didn’t look like 89 teams but it was still early and turn-ins for brisket weren’t due until 4pm the next day. There was still plenty of time for teams to show up. As I had expected, the lot was full of “stick burners”. Stick burners are typically large smokers whose fuel source is pure wood or “sticks”. Some shells are custom made from old propane tanks while most others are made by big name manufacturers like Jambo, Klose, Lang, Horizon, Meadow Creek as well as many others. As I searched for my friend Cindy, pitmasters looked at me while the sound of country music drifted in the air. I wondered how long it would be before I would hear another hip hop song. It was hard but I tried to look like I knew where I was going, even though I didn’t have a clue. Luckily, no one asked if I was lost and or needed to be pointed towards the closest academic institution, where all of the other Asian folks were gathered. A cowboy hat would have helped my city clothes outfit. Too late now. I find Cindy working on an already seasoned 8lb pork shoulder that sat on a cutting board and then on the tailgate of her black Ford truck. It hadn’t occurred to me that a tailgate could serve as a table for preparing food. I cringed a little bit and smiled at my old friend. 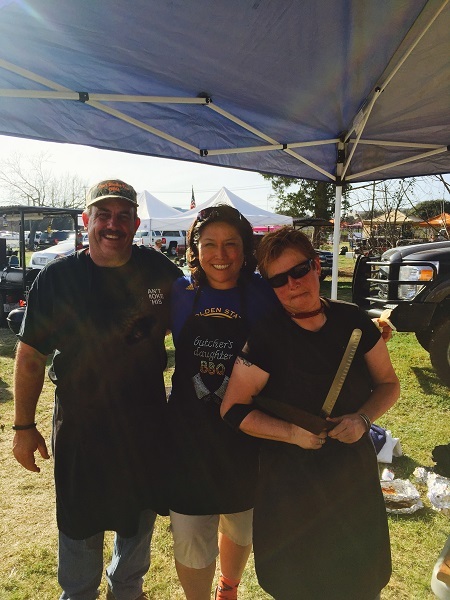 Troy Cresswell of Can’t Smoke This, Donna Fong of Butcher’s Daughter BBQ and Cindy Hayter of Die Freundliche Swine. We hugged and she introduced her buddy, Troy Cresswell of Can’t Smoke This, a team situated right next to us. As it turns out, Troy was a real blessing to me throughout the contest. I knew going in that Cindy and I were like night and day in our approaches to BBQ. I am methodical and a control freak. During competition, I look stern. Cindy on the other hand, luxuriates in story-telling and lets the meat inspire her next move. Neither approach is better than the other when it comes to BBQ. It is just a matter of style. However, when things got a bit yucky or out of control for me, Troy was there to save the day. He set us up with electricity, a light bulb and a sink with water and soap. He cooked us a sausage dinner on Friday night. And he was good company, having the same detailed concerns as I do about BBQ. God bless Troy. I repeated this in my head many times. Cindy went through a lot of trouble for me which she wouldn’t normally do on a cook. She brought a canopy, cleaned her pits, provided bedding and pillows, bought me a six pack of Shiner Bock and put a welcome sign right on top of the beer. I appreciated all of the kindness she offered and then put down my offerings of cigars and even more liquor. After our gifts were exchanged, we got down to work. I could already tell it was going to be a blast.